Why does food become more fabulous when it is stuffed? Starting with stuffed whole chickens and turkeys, stuffing evolved into a stand-alone dish on the Thanksgiving dinner table. There is the chicken cordon bleu, rolling cheese and ham inside a chicken scaloppini. A common buffet item is stuffed peppers – bell peppers filled with cooked rice and beans. Calzones are basically well-stuffed two-sided pizzas. At dim sum, you can order eggplant and bell peppers stuffed with shrimp paste. A classic Chinese dish uses hollowed-out daikon cylinders and stuffs them with re-hydrated scallops. Even doughnuts get a makeover when stuffed with jelly. And who can resist the temptation of a custard-filled cream puff? The contrast of the crispy shell and the silky filling makes it a delectable item. ( I’m so happy to have Beard Papa in NYC!) If we expand our criteria a little bit, any dumplings or buns are also “stuffed.” This kind of stuffing takes care of “scrap” meat. Ground pork and chopped shrimp are typical ingredients in dim sum items. Sausages use up any cuts of meat, emulsify them with fat, and stuff them into casings. I guess there are four reasons for stuffing. One is to make an interesting texture contrast, as in the case of cream puffs. Another one is to individualize food and make them into finger foods, like buns and hors d'oeuvres. Another is for economic reasons, saving meats that would otherwise be tossed away. The last reason I can think of is to make food interesting. But this is probably the most compelling reason. If you have access to Martha Stewart’s Hors d'oeuvres Handbook, look in its first chapter. The entire section is devoted to hundred of edible items that can be used as containers. Whether it is a cucumber cup for shrimp salad or a tart shell for creamy corn with eggs, they are gorgeous to look at and tasty to the palate. I picked reasons 3 and 4 (or rather, they picked me?) to make ground pork more interesting and to clean out the fridge a little bit. I mixed ground pork with chopped water chestnuts, minced scallions, mirin, chicken stock, salt, pepper, sherry, and freshly ground ginger. I stuffed medium-sized tomatoes and cucumber sections, using corn starch make the stuffing stick to the sides. Extra filling was made into small meatballs. These babies were pan fried on both sides and braised in chicken stock. 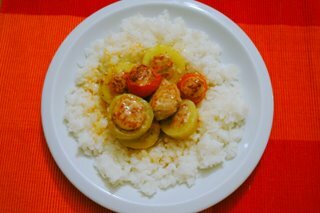 The sauce had the fullness of chicken stock, richness of pork, sweetness of cucumber, sour notes of tomatoes, and the complexity from caramelization. Oh Erica, I have been so bogged down by other things in life. That's why I haven't posted anything. I do have some pictures of yummy food..I'll post them soon.